The paintings you will see today exist because of Kati Raitinen and her invitation to join the ZilliacusPerssonRaitinen trio as a visual artist in the 2018 Äntligen måndag! chamber music series in Stockholm. Since then the 32 paintings have traveled here and there: to the Promenadigalleria in Hyvinkää, Lilla Villan in Sipoo, the Tapiola Cultural Centre in Espoo, in May in Helsinki with the Virtaa-klubi seminar with the Nobel laureate Frank Wilczek (Ateneum Museum), and this coming June in a concert of the Goldberg Variations by Janne Rättyä in the Riihimäki Summer Concerts series. My relationship with the Goldberg Variations by J.S. Bach has been a long and affectionate one. It has a simple and beautiful structure, an Aria + 30 Variations + Aria. The 30 variations are all based on the Aria’s 32 measure bass line. So sublime, and yet so simple. 32 movements, 32 measures each, divided into two equal halves of 16. Bach’s bass line both marks the passage of time and supports freedom for emotional expression. I struggled for a long time to find my own solution to this formal problem and finally came to the realisation that my visual “bass line” has always been Nature. 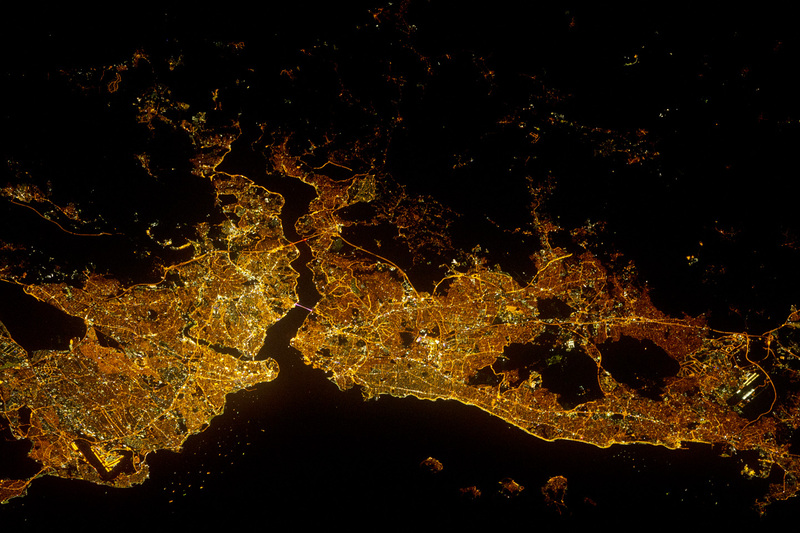 While browsing the NASA website I found this picture of Instanbul, taken from the ISS on the 9th of August, 2012. Here Europe meets Asia, split by the river Bosphorus which has been flowing since prehistory. But it is humanity which has given it the contours that underline a new geography. There is something bittersweet in seeing history erased before our eyes in such an aesthetic way.